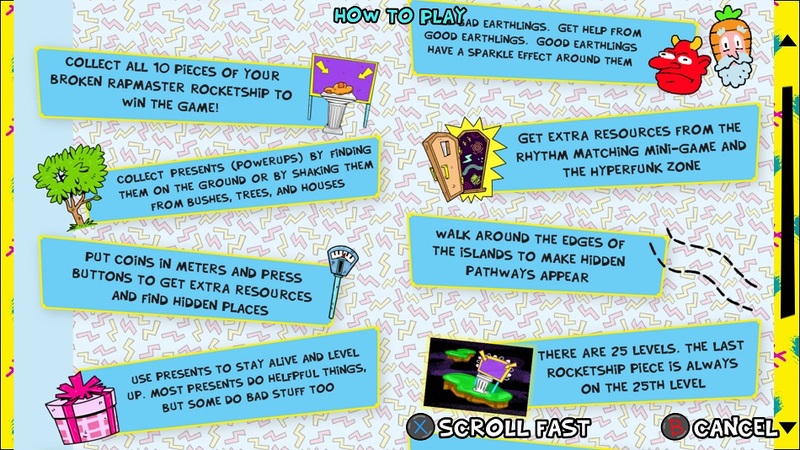 The original Toejam & Earl was a game-changer when I encountered it back in the early ’90s. It had so many things going for it. The first was my introduction to the concept of funk as a genre, The game used the fat, slabby Megadrive/Genesis sound chip to make a wonderfully bass-happy soundtrack — intrinsic to the story of two aliens from the planet Funkotron that crash-landed on Earth and were attempting to escape from its weird inhabitants. The upbeat sounds matched the colorful setting. Also new to me were the rogue-ish elements. Each run had players attempting to find missing pieces of their ship in randomized levels with randomized pickups. Death resulted in starting over from the beginning, but with newfound knowledge and experience. Finally, there was the first time I played co-op. 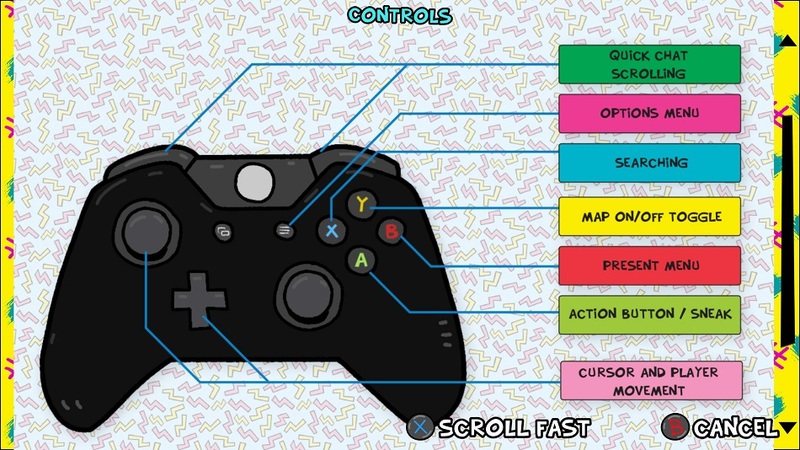 I saw Toejam and Earl walk to opposite ends of the screen and when the screen fluidly split so that they could both carry on exploring independently, my mind was blown. The second game Panic on Funkotron was an earnest, but bad attempt at doing something different; Ready, Aim, Tomatoes was a light gun spin-off game that I think I must have blacked out of my memory, and Toejam & Earl 3: Mission to Earth tried to recreate the original but lacked the charm by being saddled with a 3D engine that did it no favors. 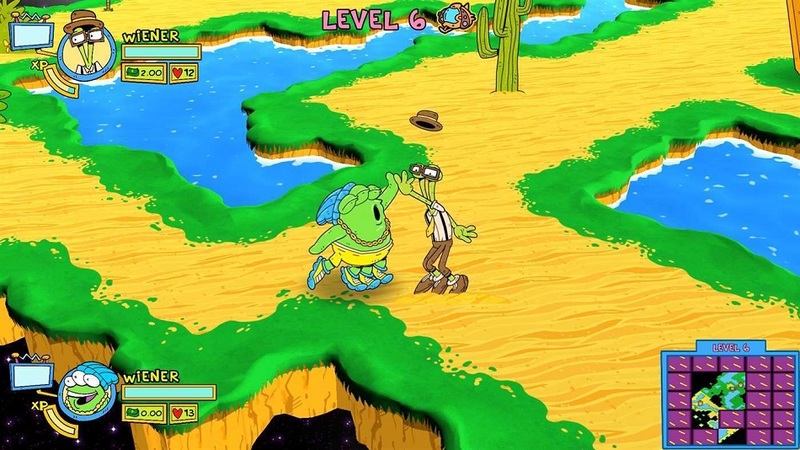 It’s now been 17 years since anyone tried to do anything with TJ&E, but with the support of Kickstarter and some of the original team, Toejam & Earl: Back in the Groove is here. First, the funk is back and modernized. Cody Wright’s tweaking of the original soundtrack evokes that classic, sludgy SEGA sound, smartly looping in a way that I found infinitely listenable. Gameplay offers 8-way exploration of a scrolling map with 2D, flat characters in a 3/4 perspective view. The new art style looks more hand-drawn and cartoony (rather than sprite-based) and I initially found the contrast between the hard-lined characters and the soft-shaded backgrounds a little jarring. That said, after a few hours I had grown used to the new look. Each level is a floating platform of grass, desert, and water that has to be explored to find presents that have random effects when opened (distracting boom boxes, rubber rings), money and, most importantly, the spaceship parts that are required to finish the game. Populating each level are a mixture of friendly and aggressive humans based on some broad stereotypes (selfie-taker, mall-cop) and not-so-broad stereotypes (wizard wearing a carrot uniform, ghost). Taking advantage of the presents found and soliciting the help of friendlies, while avoiding enemies is the key to success. The original rogue elements also remain intact. Losing all lives will end the playthrough, but smart tweaks have been made to acknowledge the changes of a modern era. Each character has visible stats, as well as a per-playthrough levelling system that helps players survive later stages. The presents still confer random things like the ability to fly for a short period or being chased by a damaging storm cloud, but now there are souped-up versions that have longer lasting impacts, or that affect the whole level rather than a limited play space. There are also now permanent unlocks in the form of extra characters that encourage multiple playthroughs and more thorough exploration of each level. 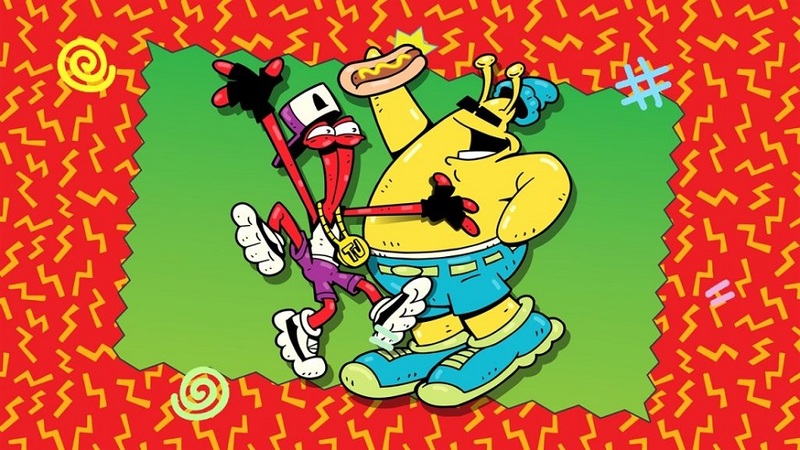 Everything I’ve written so far is from the perspective of a lifelong fan of the two Funkotronians, so I decided to introduce a couple of friends that had no experience with ToeJam & Earl to it via same screen and online multiplayer. Same-screen multiplayer went well. I enjoyed seeing my friend’s sense of discovery and I was able to help and give tips on how things work. It was also compelling to see the interplay between the two characters via the ability to share health and lives. The online multiplayer, unfortunately, was a lot rougher. The internal invite system didn’t seem to be working, and then my first attempt once finding a match had my game crash with a machinegun sound overlapped by the sound effects of my buddy wandering in the background. After messing around with who would be host we finally got into a proper game. However, due to low ping rate, we seemed to be on different maps for a while. Later we were getting bizarreness like a starship piece only being attainable by my teammate and to him I appeared to be walking on thin air. 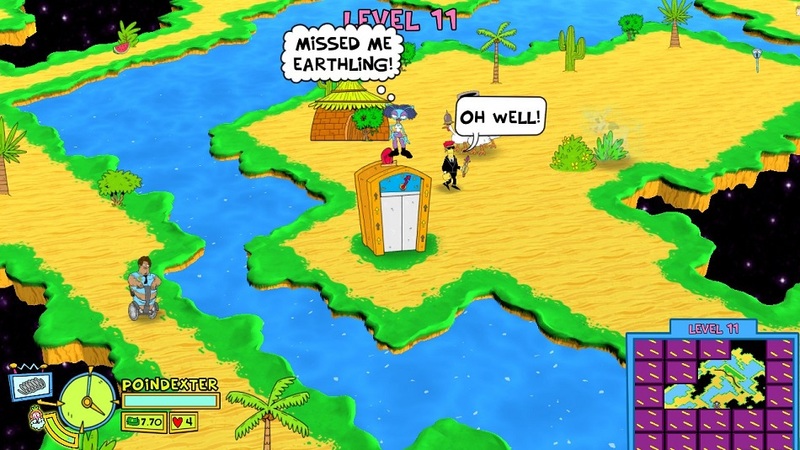 Toejam & Earl: Back in the Groove was everything I wanted from a modern revisit to the series — it’s bright, it’s funky, and it has an obvious love for the past with modern twists. The single and local components are great and the experience holds up well. That said, those looking for online co-op may want to look elsewhere. Disclosures: This game is developed by Humanature Studios and published by Humanature Studios. It is currently available on PC, Switch, PS4 and XBO.This copy of the game was obtained via publisher and reviewed on the XBO. Approximately 7 hours of play were devoted to the single-player mode, and the game was completed. 2 hours of play were spent in multiplayer modes. Parents: According to the ESRB, this game is rated E10+ and contains Crude Humor and Mild Cartoon Violence. There are some slightly creepy-looking enemies but by and large this game contains no content inappropriate for kids. Deaf & Hard of Hearing Gamers: It can be hard to tell when enemies are alerted and will give chase when they are offscreen.